In July, Ian and I went to Ireland and then Wales with some friends from the states (and some new friends from the UK) for our first taste of a typical British seaside holiday, which involved bundling up to go to the beach, serious sand-castle building, and incredibly competitive couples bocce and sandal-wanging followed by some seriously unhealthy fish and chips, plus some excitement when Ian tried to ford a stream and ended up being rescued by the coast guard. You can tell ts a typical British seaside holiday from the photos because we’re all bundled up above the waist but wearing sandals and swimsuits on the bottom – the triumph of hope over common sense. Anyway. We picked a stretch of sand and started sand-castleing, but the tide was coming in faster than we realised, and so we dug frantically for an hour and then spent 20 sad minutes watching our hard work get washed away (and peed on by a passing dog). 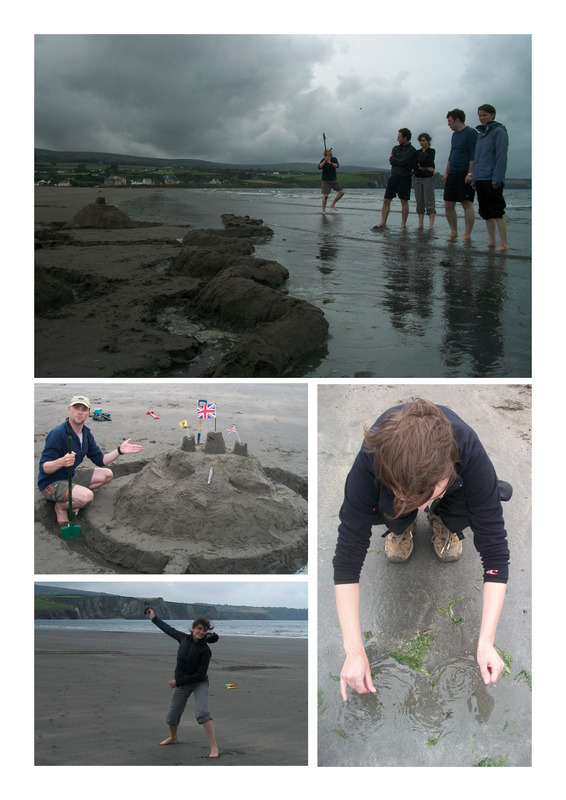 Shortlived though it may have been, its safe to say that our sand-castle was the most magnificent piece of architecture on the beach that day, thanks largely to the quick thinking of our chief engineer, Dom (pictured above next to his creation).